A good Christian historical fiction book for everyone ages 11+. My favorite book in the entire series, so far! The twins, Peter & Elise Anderson, along with their Jewish friend, Henrik, accidentally end up on German submarine... which is taking them into who-knows-where --- maybe into enemy lines. World War II has actually just ended, yet the crew on this submarine seems to still be enemies towards the Danish. Apparently, the German crew is attempting to wedge one more secret mission in for their fatherland, with all lives on board at stake. I learned a lot about submarine technology, that's for sure. 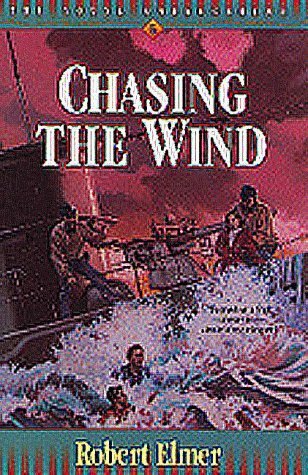 "Chasing the Wind" was quite an enjoyable read for me, and I'm so excited to see what happens next! It was more of a 3.5, the predictable love story kept it from being a 4. Amalise Catoir is a lawyer who has just returned from a hospital stay after a car accident that killed her husband. She searches, and finds, what is really important in life - helping others in the family that lives in the neighborhood her client is planning to tear down. The plan was a scam and Amalise gets away her own plan. I really liked this even though I thought some of the story lacked depth and some of the plot was underdeveloped. I am really enjoying this series by Elmer. Set in WWII, the three friends end up captured by Germans on a Uboat. My daughter has read this series several times. It has helped her have a broader scope of what occurred during the war. The books are suspense and great reads, but they are not in the least graphic or violent.I have found finding books that are decent, clean, and faith based a bit difficult for my 12 year old daughter, but she had thoroughly enjoyed every book she has read by Robert Elmer.With a great storyline mixed with true history...it's a win-win for parent and child. This is the fifth book in the "Young Underground" series. The characters: Henrik, Peter, and Elise get a little too inquisitive and end up getting trapped on a German sub!Even though World War II is over this crew on the sub wants to keep hurting the Danish people. Come along for the ride as they try to figure out their escape plan. Will they be able to make it back home, get stuck with no way out, or worse? Find out in this exciting book! I am definitely looking forward to reading the next book to see what the next adventure will be. Peter and Elise are at it again with their friend Hendrich to help stir up mischief. The kids decide to make a sail boat out of their grandfather's old row boat. On a test run they run into German treasure hunters and are kidnapped and forced to work in the galley of a German U-Boat. Continued adventure and struggles for these kids abound. Will they escape in time before the US air carrier takes action against the Germans. This book is the 5th in the Young Underground series. In this book Peter, Elise, and Henrik are captured and are stuck on a German submarine, the only one left. Will they escape with their lives? Will they find the treasure? I recommend this book to everyone. I rate this book 4 out of 5 stars. Robert Elmer - Robert Elmer is a former reporter and ad copywriter who writes part-time from his home in the Pacific Northwest. He is the author of over fifty books, including nine contemporary novels for the adult Christian audience, two nonfiction titles, and seven series for younger readers. He's also a contributor to kids' versions of the popular "Case for" books co-authored with Lee Strobel. Among kids, he is best known for his "Young Underground" and "Adventures Down Under" books. When he's not at the keyboard, he enjoys sailing and hiking with his wife, and spending time with their three kids--plus a growing number of little grandchildren.